On any given day, millions of people who depend on New York City subways wake up and wonder how much extra time they should take to make it to their job. The Metropolitan Transportation Authority (MTA) is literally taking hours off of our lives each week. If you want to get a quick sense of the stress being caused to New Yorkers by public transportation, a Twitter search of #fucktheMTA should do the trick. “We are being held momentarily by the train dispatcher” and “We are delayed because of train traffic ahead” are two sentences that New Yorkers dread hearing, and they seem to come on a near-daily basis. They are infuriating not only because of their content but their vagueness. What is causing the delay this time?! Is it a power outage? Twice over the course of three days in May, power outages at the DeKalb Avenue stop in Brooklyn caused extensive disruptions in subway services. The second required a horrifying evacuation of thousands from the platform at peak rush hour. Or are you going to be late because of overcrowding? Trains are delayed every morning by the scrum of people — many of whom have unsuccessfully tried to board previous trains — packing themselves into the cars so tightly that the doors can’t close. One in three weekday trains are delayed — more than twice as many as in 2012. The train system’s problems aren’t new — any New Yorker who relies on the subway could tell you that things have been getting worse for years. But it seems that the effects of decades of neglect of the subway infrastructure for decades are beginning to come to a head. As of 2014, of the 468 subway stations, only 51 were not in need of fixes and repairs. A report from the Citizens Budget Commission estimated that at the current pace, the MTA would finish these repairs in 50 years — by which point, of course, hundreds more staircases, platforms, and ceilings will be broken. Incredibly, the subways for the global center of capitalism rely on a signal system that dates back to the pre-computerized World War II era — and it will take fifty years and $20 billion to update the entire system at the current pace. In recent years, politicians and MTA officials have prioritized completing the much-hyped Second Avenue subway line, which serves the wealthy Upper East Side neighborhood, over less visible upgrades needed for a system in dire need of repair. What New Yorkers are experiencing today is a shift from quality to quantity in their declining subway system: years of crumbling infrastructure is now producing a collapsing infrastructure. [T]he era of improvement has ended, and the subway has reversed course. Money for basic maintenance has been drying up: For the past four years, the funds for keeping the subway in what is quaintly called a “state of good repair” have been 29 percent lower than the MTA’s own needs assessments, according to an analysis by the Regional Plan Association. This translated into $483 million less for the relay-and-stoplight system; $685 million less for repairing and modernizing the power substations that deliver electricity to the trains; and $668 million less for line equipment, which includes ventilation, lighting, and pumps for the tunnels. The stations themselves got $639 million less. What makes these shortfalls so ominous is that the New York subway is always inherently falling apart — rigorous maintenance is the only defense against the natural pull of entropy. A constant infusion of money is necessary just to ward off the forces of decline, and yet the system is continually cheaped out by the state: Last month, Governor George Pataki said he would give the MTA only 69 percent of the funds it requested for its next five years of capital upgrades and repairs — an $8.5 billion kick in the trousers. The sounds of alarm are now coming not just from cranky gadflies, but from the MTA chairman himself, Peter Kalikow, who recently warned that 2005 could resemble 1975, the year the subway began to decay rapidly. 1975 was the height of New York City’s infamous “fiscal crisis,” a turning point in both New York and nationally for rolling back social programs and shifting their costs onto the backs of working people. It’s impossible to understand what’s happened to the subway system without seeing it as a part of this history. In the late 1970s and early 1980s, trains were dirty and rickety, and the lights never stayed on. Tourists were warned to avoid the underground caves of crime and filth. The slogan of the New York City subways could have well been “deferred maintenance.” Government funding was a non-entity, so repairs just never got made. Instead emergency patchwork held train cars and stations together. On the elevated trains in the boroughs, falling pieces of metal became commonplace. Complaints about inadequate or dangerous transit were the top reason for contacting City Hall in 1981. A trip that would have taken ten minutes in 1910 now took four times longer. Improvements had to be made, but the money wouldn’t come from the city’s abundant upper class. Instead, these projects were paid for in two main ways: deficit spending and fare hikes. The half-fare senior program and the half-fare Sunday program were eliminated (most younger New Yorkers don’t even know these programs ever existed), and fares were raised from fifty cents in 1980 to three dollars for a single ride today. Then there’s deficit spending. 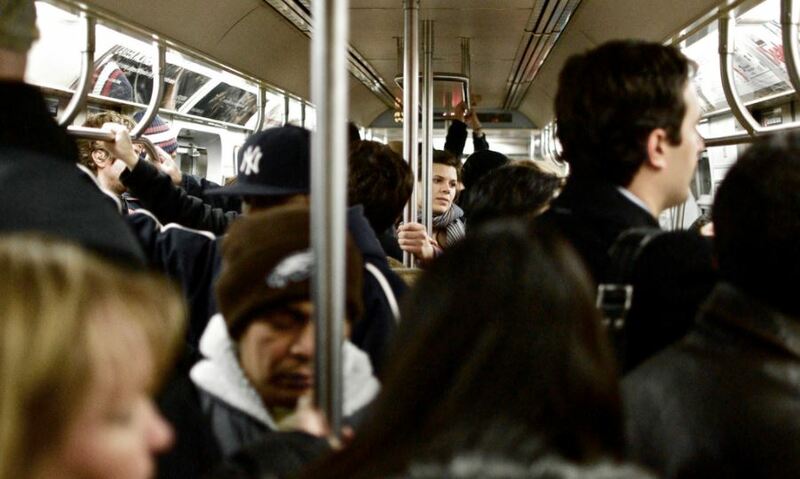 The MTA’s debt is $34.1 billion — larger than that of thirty nations. Deficit spending is 17 percent of the operating budget, and debt service and income payments are the largest expense. As this video from #NoFareHikes breaks down very well, most of the fare hikes New Yorkers constantly endure don’t go to salaries and pensions for transit workers — as the media likes to portray it — but paying off higher interest rates for already wealthy banks. One-third of people who ride the subway make less than $25,000 a year and two-thirds are people of color. These are the people making up the bank’s surplus fees. This is the biggest scandal of all, and it’s the essence of the neoliberal policies that have dominated politics for the last four decades: starve public services, blame workers for being greedy and wanting their wages to keep up with life, allow ceilings to fall on people’s heads, and then have those people foot the bill to repair the very vehicles which allow them to get to work so that profits can be made for the rich. It’s laughable that a city that’s the center of world finance doesn’t have money to get the six million people who work for a living to work every morning. But it’s even more egregious that the riders who pay a higher amount of their income each year to ride public transit are funding the banks. And to top it all off, the money we’re paying is diverted to opening fancy new stations open to serve the parts of the city where we will never be able to live. While Gov. Andrew Cuomo and Mayor Bill de Blasio, both of whom admit that they barely use the subway, tussle over who holds responsibility for the mess that is public transportation in the city, we need to focus less on their meaningless drama and figure out how to reverse the tide of working-class people being forced to pay more and more for a system giving us less and less. Demands around fare reductions, better transportation services, and repairs to all stations and lines have constant appeal in a city set up like New York City. There is no question that in a moment like this, a movement could be built to pressure the city and state officials to serve working people and not allow our hard-earned wages to bolster bankers. We should also remember that our most powerful allies in this fight are the public transportation workers, members of Transport Workers United Local 100. They are the ones forced to deliver the bad news about “train traffic ahead” and “due to an earlier incident,” but they’re not the ones causing the problems. A movement could be built that links the interests of train workers and riders, that connects the MTA’s abysmal service with the racist “broken windows” policing that targets black and Latino youth for jumping turnstiles — a “crime” that can actually lead to deportation. To do any of this, we have to build a broad and independent campaign that can put forward a vision for where this funding will come from, why ordinary people deserve better and that workers are the ones who have the power to bring the whole city to a stop until our demands are met. This originally appeared in Socialist Worker. Danny Katch contributed to this article.